A very common misconception is that keloids occur almost exclusively in blacks. Though the incidence and genetic predisposition is far greater in that population, they don’t have a monopoly on this disorder. Virtually all ethnic groups can develop keloids though the risk is higher in those who are darker complected. This includes, for example, Native Americans, those of Asian, Hispanic and Middle Eastern descent and even Italians, Pakistanis and Indians. However, I have treated keloids in numerous fair skinned patients such as those of Irish and British heritage. 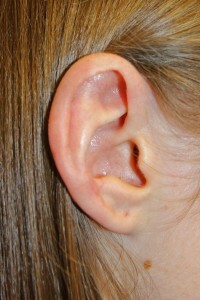 Though keloids can develop in many areas of the body, the ear and earlobe are at or near the top as the most common area of involvement. This is not so much that the area is intrinsically a high risk one especially when other variables are factored in but rather that it is much more commonly subjected to trauma, irritation and infections – typically from ear piercings. Indeed, in the overwhelming majority patients who seek treatment from me for keloids of their ears and earlobes, the precipitating causes are issues associated with pierced ears. Often there is an added history of chronic irritation, infection or an allergic type reaction to the earrings, particularly those made of steel or silver. 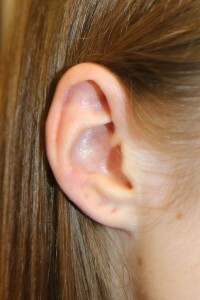 A representative example of this is the following teenage patient of mine who experienced some inflammation of her right ear following its piercing. 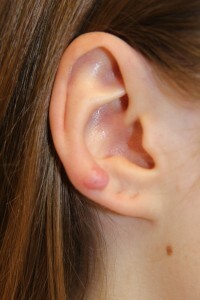 Subsequently, a keloid developed and continued enlarging in size (photos A and C). During her consultation, various options were discussed and she elected to proceed with surgical excision and steroid injection. Surgical removal of the keloid of the ear with reconstruction was performed and a small amount of steroid was injected into the area. At only two months her scar is already inconspicuous and there is no noticeable deformity in the area (photos B and D). If you would like more information on keloids and their treatment or for any other plastic surgery procedure that I perform or to schedule a consultation with me, please call my office at 480-451-3000.